About – AC Plus Marine, Inc.
AC Plus Marine, Inc., is a woman-owned company, which has been in business since 1994. Over the years, AC Plus has worked primarily in the commercial marine industry, has designed, built, maintained and refurbished equipment for our customers, always keeping energy efficiency and ease of maintenance and repair at the top of our priority list. During this time, we developed custom designs for high efficiency HVAC, refrigeration, water purification, diver hot water, and surface and deep saturation diving systems. These have included complex semi-automated and automated operations. AC Plus is an expert in thermal transfer, our designs have been extremely energy efficient and include waste heat recovery when possible. AC Plus has also refurbished, serviced, designed, built and installed equipment for the shallow and deep saturation dive industries, as well as providing technical support and specialized equipment for major commercial aquariums. Documentation provided is accurate and in-depth, and provided throughout the design, build, test, installation and operation of equipment and systems. Exacting quality assurance and processes ensure equipment is built to the required standards and codes. Our focus now is providing diving services out of the Orlando area as well as out of our Western Kentucky location and in Washington state. 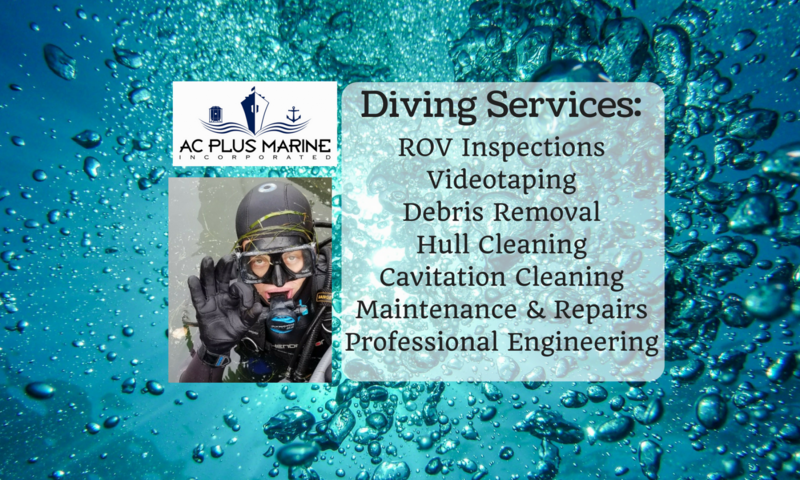 AC Plus Marine, Inc., provides quality commercial diving services including ROV inspections, videotaping, debris cleanup, maintenance and repairs, and cavitation cleaning of hulls and underwater structures. Our capabilities also include professional engineering services for designing and building related equipment and structures through our partner, Matrix Engineering (a licensed PE in both Kentucky and Florida).